Shadi Afshar is a curator, multimedia and fashion artist. She received an MA at the Goldsmiths University of London in Design Critical Practice. 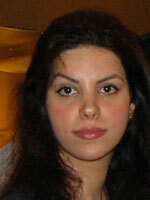 She is the co-founder and art director of the East Art Gallery in Tehran. She has curated “Costume Design Festival” in the context of contemporary art for the first time in Iran. Her focus is on performance art, video art and fashion design. She lives and works in Tehran and London. The Project will be held from 3 May 2013 till 14 May 2013 at the East Art Gallery between 5 pm till 8 pm. Ten days, each day we will screen 10 artists of a decade and the programme will be followed by series of lectures with provided demos and critiques on our website, weblog and professional Art journals.